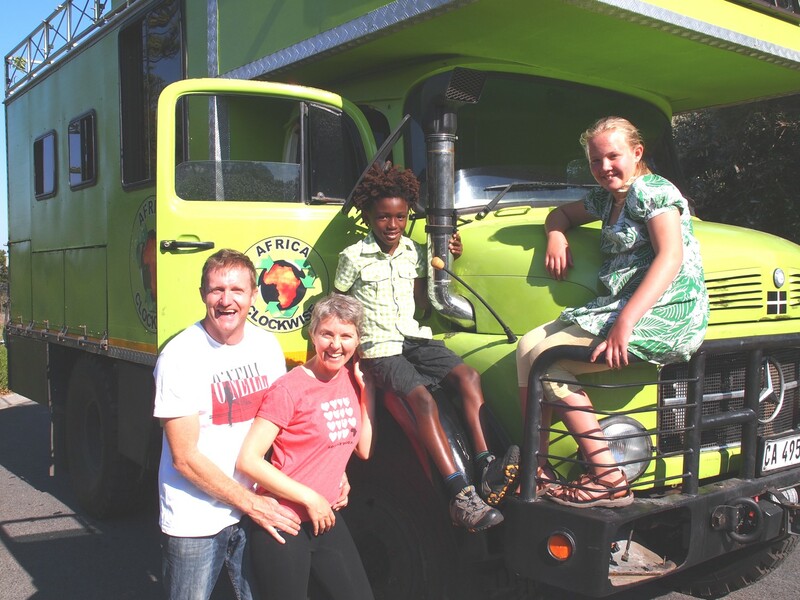 Africa Clockwise is the name of the epic journey stand-up comedian Mark Sampson, writer Sam Pearce and their children Ruby and Zola are undertaking around the circumference of the continent in their Big Green Truck, fuelled by recycled waste vegetable oil and solar power. 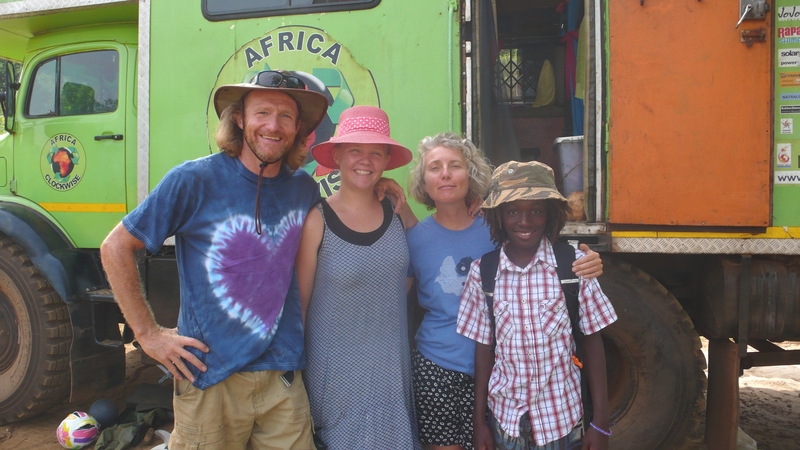 With our ecological clock ticking, the Sampsons are on a mission to investigate how Africa can show the world how to cope with climate change. The journey in the Big Green Truck is ‘clockwise’ – both as a direction, and as an awareness: time now is crucial and we all need to wake up and take proactive steps to prepare for an environmentally compromised future. Africa Clockwise is also a quest to discover whether it is possible for their kids to live happily without wifi or water on tap – like the majority of the continent’s children. A quest to investigate whether a future without fossil-fuelled luxuries may not be such a bad thing, helping us to focus on quality of life experiences, not quantity of possessions. 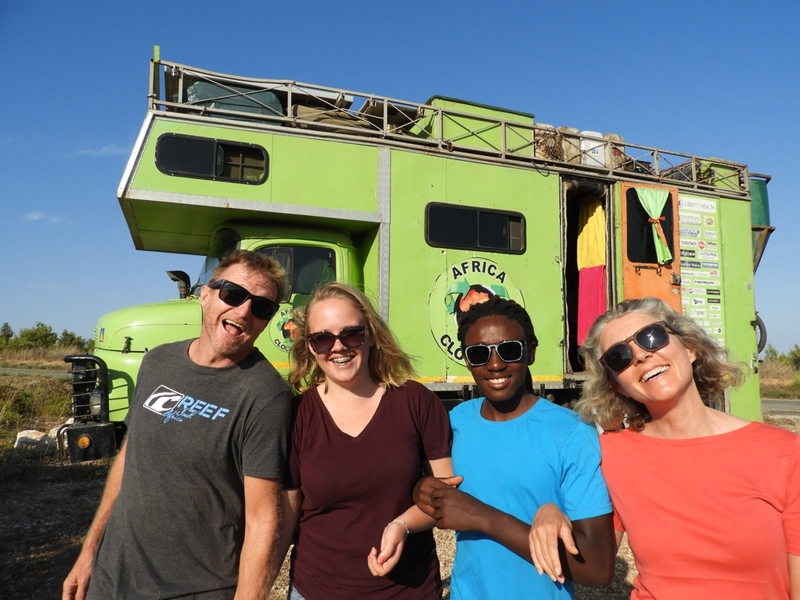 Our positive stories aim to challenge clichéd images of the ‘overwhelming doom of global warming’ and ‘the dark continent’ and to hold hands out across Africa, spreading a message of connection and mutual support. Like us on Facebook, follow us on Twitter and Instagram and look out for Africa Clockwise the show on our return in 2020! mark you and your family are an inspiration boet…will be following you…enjoy the waves! epic trip , gonna follow you. Look forward to doing something similar soon, before it’s tooo late. Thanks a million for this awesome offer Hennie! We would love to be getting the same tracking treatment as Chris Venter and his Scooter Addicts – email mark@africaclockwise.co.za. Very inspirational Mark. Just watched you on this TV programme on the 23 April 2018 during your visit in Ethiopia. I really got motivated with what you and your family is doing. 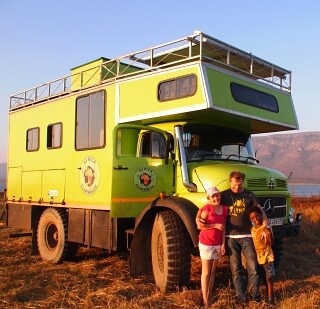 Like, the Tsitsikamma to Tataouine Expedition (http://www.t2tafrica.com/) that another team of South Africans is undertaking, I hope these journeys shift the global perception of Africa. Godspeed all! I want to really appreciate your time and hospitality shown me and my friends today when we visited you and your family in your truck by the Drill Ranch in Calabar. I wish you God’s protection and God’s speed as you travel round Africa. i wil like to help you as a tour guide am in calabar cross river state nigeria. I saw you today at the national museum when you were about to go out of the museum. I was born and i grow up here in calabar cross river state. Am 20 years old of age, i like adventure tour like yours. I love what you are doing and the reasons behind it. I’ve not been to Africa but suspect that I’ll learn a lot from following your blog. Getting right to the point I hope you don’t mind that I’ve done a pingback to your blog for my readers to find you and read about your journey. My journey has been a different one, I moved to Russia over 2 years ago to be with my new wife here. I started a blog to share about life in Russia. Then while blogging I started a section called mirror reflections, it’s a way for others to see that Russia isn’t the big bad wolf so to speak. It has become the center of my blog connecting cultures together allowing the to see the similarities we all share. Such a rewarding experience for the family and very interesting reading for us all. I hope you and the children had a super time in the UK celebrating your parents anniversary. Inci (travelled together to the UK from Casablanca). Wow! what an amazing story and adventure, highlighting a global matter. Envious and humbled, I will stay tuned and wish you guys all the best. What w worthwhile ‘adventure’ which I will be following with great interest. Am very piques to know how u manage without ‘water on tap’ something us urbanites take for granted. But I’m interested how , NOT having a tv. Will influence the children especially. I’m sure they will become even more aware of their surroundings and become more perceptive human beings. Hello Mark and family, I trust you are all well! have loved keeping up with your movements! Been a most wonderful thing what you have achieved! No doubt it will continue! Very interesting and adventurous! Must have been a great learning experience for the kids too! Mum, this website is truly amazing, and your writing leaves everyone, me included (although I was there!!) spellbound. Thank you for the time and effort you put into this blog, I will remember the great adventures we had and are having in full colour because of you, thank you. Thank you for your entertaining and inspirational visit to ICS Addis Ababa. Will be following the rest of your journey here. Nice to meet you in Addis Ababa Ethiopia at Sheraton Addis , Have a great journey for the rest of your trip. Greetings of love and light, I pray this finds you all well…I am a friend of Jo and family here in.Addis Ababa and she has just told me about you and your incredible journey ….I have tried unsuccessfully for many, many years to find anyone in Ethiopia to help me convert my Toyota Pick-up Diesel to run on vegetable oil..? 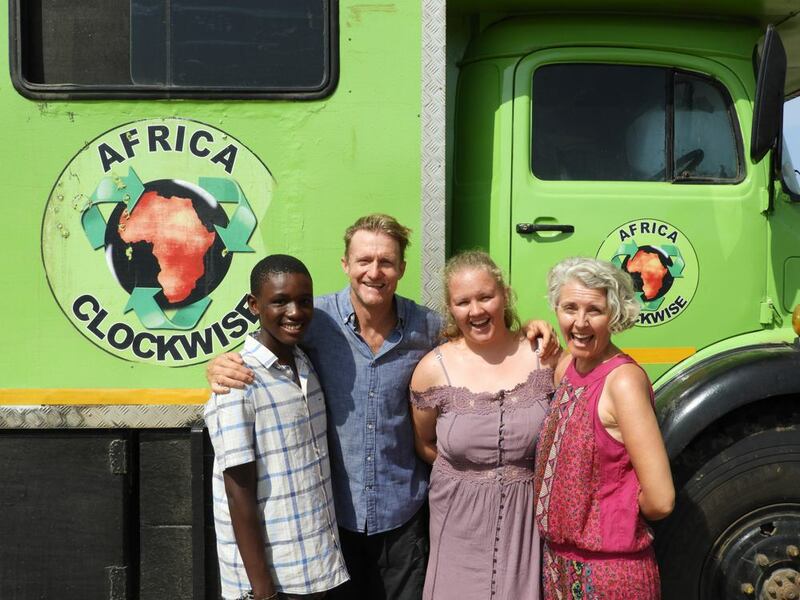 Sister Tibebwa, thanks so much for your enthusiasm, please email mark(at)africaclockwise.co.za and Sampson will send you some tips! Great ,what a lovely moments, I meet at our area Sololo while relaxing near Damballa fachana. Thanks you so much for the sacrifice to make the world a better place to live in. I spotted your truck in My home town (Mombasa) on Sunday 15/7/2018. Have brought up my kids with no electronics and I have loved this with all challenges theybhave had to go thru die to pressure from other kids who have and live thru with electronic world. Am only eager to learn how u managed basic needs and money issues… If not working and making money for basic needs…. Thanks so much for your enthusiasm Saada! We do not have a cash sponsor so we survive on what’s left of the rent of our house in Cape Town after paying our daughter’s boarding school fees. Visas and breakdowns are our main expense; we buy very little else apart from rice, veg and eggs. We couldn’t have made it this far without the generosity of Michelin, Tractafric, Treetops Renewables and Victron Energy giving us tyres, truck servicing and solar systems respectively, as well as all donations from those on our sponsor page. I Like your vintage Green Truck! Pre-ME I visited Kenya. Your photos remind me of the beauty. Good luck with Mombasa Doctors. Blessings to all your family. The sun shines through from your spurted writing. It’s me from the sauna. LOL..
leave alone your mission and vision. keep it up. Wonderful to meet with you today Mr Gordon! Thank you for all your advice, we appreciate it.